Predicts risk for serious outcomes at 7 days in patients presenting with syncope or near-syncope. Use in adult patients presenting with syncope or near-syncope who are back to their neurologic baseline. Do not use in patients with persistent or new neurologic deficits, alcohol or drug-related loss of consciousness, definite seizure, or transient loss of consciousness from head trauma. Adult patients presenting to the emergency department with syncope or near syncope of unknown etiology who are back to their neurologic baseline. Persistent altered mental status or new neurologic deficits. Alcohol or drug-related loss of consciousness. Transient loss of consciousness due to head trauma. The most common serious outcome in the studies was cardiac dysrhythmia. Most were bradydysrhythmia or sick sinus syndrome, the remainder were supraventricular or ventricular dysrhythmias. Other common serious outcomes misclassified as low risk were stroke and intracranial hemorrhage (see Evidence for details). Note that validation studies were not able to replicate the high sensitivity found in the original studies published by the creators of the rule. Congestive heart failure (history of). Systolic blood pressure less than 90 mmHg. Syncope may be relatively benign or a manifestation of serious underlying pathology. ED physician gestalt is highly sensitive but poorly specific for predicting high risk patients. The creators designed the rule to improve specificity while maintaining high levels of sensitivity. The tool can be utilized to predict low risk syncope patients who would not likely benefit from aggressive work-up and hospitalization, thus reducing unnecessary testing, healthcare costs, and potential harms associated with hospitalization. Emergency physician gestalt has been found to be 100% sensitive and 30% specific for identifying high-risk syncope (Sun 2007). Even at best, the SF Syncope Rule is not 100% sensitive, so if there is any concern for serious underlying disease, the patient should undergo further workup. While no serious clinical outcomes were missed, many low-risk patients were unnecessarily admitted to the hospital (the goal of the study was to decrease unnecessary admissions while retaining high sensitivity). Validation studies were not able to replicate the high sensitivity found in the original studies published by the creators of the rule. From Quinn et al, 2005. Clinician judgment should prevail, even if patients are deemed low risk by the San Francisco Syncope Rule. If there is significant concern for a serious underlying cause of the patient’s syncope, workup should be expanded. This rule has a 96% sensitivity and 62% specificity for serious outcome - negative predictive value: 99.2%; positive predictive value 24.8%. However, an external validation at the Albert Einstein College of Medicine showed a lower sensitivity of 74%. Serious outcome in this study is defined as "death, myocardial infarction, arrhythmia, pulmonary embolism, stroke, subarachnoid hemorrhage, significant hemorrhage, or any condition causing a return ED visit and hospitalization for a related event." Since its inception, the San Francisco Syncope Rule has undergone considerable scrutiny and has been evaluated in many validation trials and meta-analyses (key studies: Sun 2007, Birnbaum 2008). The initial derivation study (Quinn, Stiell et al 2004) was a single-center, prospective cohort study looking at patients with a chief complaint of syncope or near syncope. Fifty predictor variables selected from literature review and expert consensus were incorporated into a survey completed by the physician evaluating the patient after a syncopal episode. The patients were followed through hospital admission and/or contacted at seven days after the initial presentation to assess for serious outcome. The predictor variables associated with serious outcomes were identified on univariate analysis. Recursive partitioning was used to find the best combination of predictor variables that would maximize specificity while preserving high sensitivity. Once the combination of predictors was identified, the rule was applied to the derivation set of patients resulting in sensitivity of 96% and a specificity of 62%. The rule was validated by Quinn et al two years later with another single-center, prospective cohort study. Physicians treated patients with syncope or near syncope in their usual manner and were then asked to fill out a questionnaire about the patients that included the five SF syncope predictors. After following the patients for 30 days, the SF Syncope Rule was able to predict serious outcomes in all but one patient (sensitivity 98%). The rule boasted higher specificity than physician judgement (specificity 56%), estimating a decrease in overall admission rate by 7% if applied. The one missed patient was a suspected TIA related to extensive carotid and vertebral artery disease requiring a stent. Several external validation studies and meta-analyses have also examined the SF Syncope Rule in the time since the derivation study. Sun et al externally validated the rule with a single center, prospective cohort study with a sample size of 477 patients. Using definitions, exclusion criteria, and methods similar to the internal validation study, they found a sensitivity of 89% and a specificity of 42%. Of the 6 patients misclassified as low risk, 3 were dysrhythmias, 1 CVA, 1 ICH, and 1 HOCM. This study also compared physician judgment to the clinical decision rule. Physician judgment had a sensitivity of 100% and a specificity of 30% for predicting serious outcomes at 7 days. Another single-center, prospective, observational cohort study by Birnbaum et al performed at a large urban academic center in New York found the SF Syncope Rule did not perform as well as previously reported. The study found the rule had a sensitivity of 74% and specificity of 54% for predicting serious outcomes at 7 days. The rule would have decreased overall admission rate by 41% but misclassified 16 of the 61 patients with serious outcomes as low risk. Physician judgement in this study was 100% sensitive. In a written response to the study published in Annals of Emergency Medicine, derivation study authors criticized the study for incorrect application of EKG criteria used to define high-risk in the study. The original study authors argued the subjective interpretation of the EKG is enhanced when performed by treating physician familiar with clinical context. They posited the sensitivity of the rule in the New York study was decreased because EKGs were retrospectively evaluated by experts rather than evaluated by the physician seeing the patient. Meta-analyses published in the Annals of Emergency Medicine (AEM) and the Canadian Medical Association Journal (CMAJ) found sensitivity and specificity similar to the external validation study by Sun et al. The sensitivity was 87% in the CMAJ meta-analysis and 86% in the AEM meta-analysis. Specificity was 52% in the CMAJ and 49% in the AEM meta-analyses. The most commonly missed serious outcome in all the studies assessing the predictive value of the SF syncope rule was cardiac dysrhythmia. Quinn JV, Stiell IG, McDermott DA, Sellers KL, Kohn MA, Wells GA. Derivation of the San Francisco Syncope Rule to Predict Patients With Short-Term Serious Outcomes. Annals of Emergency Medicine. 2004;43(2):224-232. Quinn JV, McDermott DA, Stiell IG, Kohn MA, Wells GA. Prospective Validation of the San Francisco Syncope Rule to Predict Patients With Serious Outcomes. Annals of Emergency Medicine. 2006;47(5):448-454. Sun BC, Mangione CM, Merchant G, Weiss T, Shlamovitz GZ, Zargaraff G, Shiraga S, Hoffman JR, Mower WR. External Validation of the San Francisco Syncope Rule. Annals of Emergency Medicine. 2007;49(4):420-427. Birnbaum A, Esses D, Bijur P, Wollowitz A, Gallagher EJ. Failure to Validate the San Francisco Syncope Rule in an Independent Emergency Department Population. Annals of Emergency Medicine. 2008;52(2):151-159. Serrano LA, Hess EP, Bellolio MF, Murad MH, Montori VM, Erwin PJ, Decker WW. Accuracy and Quality of Clinical Decision Rules for Syncope in the Emergency Department: A Systematic Review and Meta-analysis. Annals of Emergency Medicine. 2010;56(4):362-373. Quinn JV, McDermott DA. ECG Criteria of the San Francisco Syncope Rule. Annals of Emergency Medicine. 2011;57(1):72. Saccilotto RT, Nickel CH, Bucher HC, Steyerberg EW, Bingisser R, Koller MT. San Francisco Syncope Rule to predict short-term serious outcomes: a systematic review. CMAJ. 2011;183(15):E1116-26. 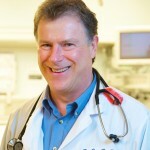 James V. Quinn, MD, MS, is a professor of emergency medicine at Stanford University School of Medicine. He is also the director of research in the emergency medicine department at Stanford University and serves as a member of the Scientific Advisory Board for iRhythm Technologies, Inc. Dr. Quinn’s primary research is focused on management of syncope.